Imagine this. You’re walking down a quiet street with your girlfriend or your wife, maybe even you mom (if you don’t have one of those) and a robber jumps out at you. He is threatening you, shouting loudly “give me your wallet now or I’ll kill you”. He has the look of desperation in his eyes. You feel he is dead serious and he pushes you back into a wall and shows you he has a knife. What do you do? I often wondered what I would do in that situation. A few years ago I probably would have froze, lost my wallet and maybe much worse ended up dead. Since then I have learnt a martial art calledKrav Maga. When I travel with my loved ones, I am safe in the knowledge that I can do my best to protect myself and them in many different situations. How is Krav Maga different to many of the other martial arts out there? Overall the philosophy of krav maga is about getting away. Your primary objective is about getting as far as possible from your attacker. Why? Because that means you survive. Only using force when absolutely necessary. The closer you are to the attacker the easier it is for him to pull a knife and stab you. That does not mean that Krav Maga is a coward’s martial art. Far from it. There are times where it is impossible for you to get away. 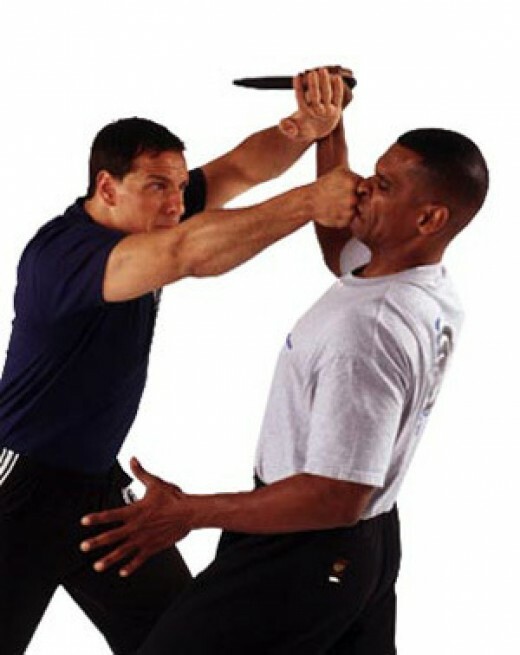 Krav maga teaches you how to block attacks and defend at the same time, hence breaking the attack pattern of the threat and taking advantage of his confusion by responding with total aggression until the threat is neutralised. See picture below for a good example. This martial art is used by many of the worlds military and police; the Israeli defence force, the FBI, SWAT, NYPD and the United States special forces to name a few. I would say that krav maga is so succesful because it’s so simple to learn and very effective. Men and women can use it, young or old! I had studied karate, kung fu, ju-jitsu and many more martial arts, but I always felt that I needed ten years to master them and they just never seemed very practical at the lowers levels. After the first krav maga class I felt as if I could already use the stuff I learnt if I needed to. Most moves rely on your body natural reactions. When someone chokes you what do you do? You put your hands up to prevent the choke. Now what? Well Krav Maga teaches you to hook your hands and pull back violently on their arms. Because your back muscles are stronger than their grip. You break the choke hold. Remember how I told you that we defend and attack at the same time. In this case a knee to the groin should help! Krav maga is a reality based martial art. What this means is that it prepares you for what actually happens in a street fight. That there are no rules and some people who fight know this. We humans have our own weapons; our heads, hands (fists) and legs. Attackers can have other weapons such as knives, bottles, baseball bats and guns. There can be multiple attackers and if you not prepared and know what to do in this situation it can be deadly. I remember the last exercise of my fist Krav Maga exam, called P1. I had to fight five people who were using multiple modes of attack. One was trying to punch me, one with groin kicks, then two others had weapons a rubber baseball bat and a knife. The final attacker was trying to strangle me. This lasted for 5 minutes and felt like an eternity. This showed me how difficult it is fighting multiple people and how knowing exactly what to do in that situation can be a matter of life or death. If you want to see one of the best krav maga trainers in the world then watch the video clip below. Everytime I watch that clip I get inspired!